Broadcast live from METLIFE STADIUM, EAST RUTHERFORD, NJ. WrestleMania is the home of incredible moments, the birthplace of legends and the center of the WWE Universe. Which Superstars will etch their names into the history books at The Showcase of the Immortals? 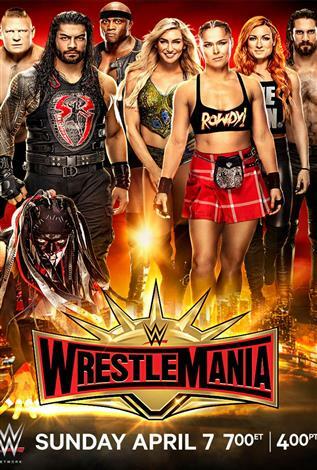 Don’t miss Seth Rollins, Ronda Rousey, Charlotte Flair, Becky Lynch, Brock Lesnar, Randy Orton, Sasha Banks, Finn Bálor, Daniel Bryan, Braun Strowman and all your favorite WWE Superstars compete at WrestleMania, Sunday, April 7th at 7PM ET/4PM PT, live on WWE Network. A WWE production. Go to WWE.com for more details.